William Temple was born October 15, 1881, and baptized three weeks later, on November 6, in Exeter Cathedral. His father, Dr. Frederick Temple, Bishop of Exeter and then of London, became Archbishop of Canterbury when William was fifteen. Growing up at the heart of the Church of England, William’s love for it was deep and lifelong. Endowed with a brilliant mind, Temple took a first-class honors degree in classics and philosophy at Oxford, where he was then elected Fellow of Queen’s College. At the age of twenty-nine he became headmaster of Repton School, and then in quick succession rector of St. James’s Church, Piccadilly, Bishop of Manchester, and Archbishop of York. 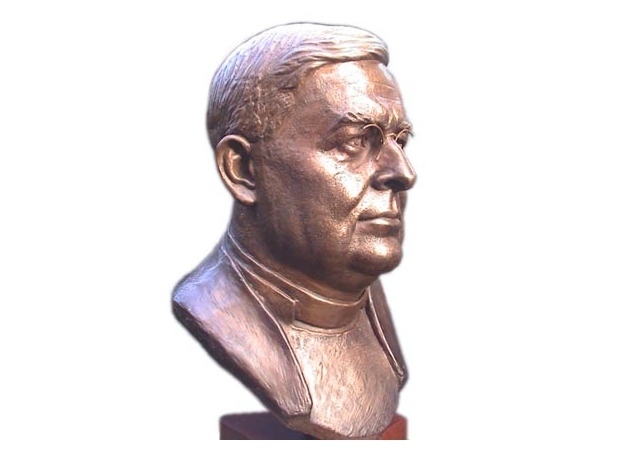 In 1917 Temple resigned from St. James’s, Piccadilly, to devote his energies to the “Life and Liberty” movement for reform within the Church of England. Two years later an Act of Parliament led to the setting up of the Church Assembly, which for the first time gave the laity a voice in Church matters. As bishop and later as archbishop, Temple committed himself to seeking “the things which pertain to the Kingdom of God.” He understood the Incarnation as giving worth and meaning not only to individuals but to all of life. He therefore took the lead in establishing the Conference on Christian Politics, Economics and Citizenship (COPEC), held 1924. In 1940 he convened the great Malvern Conference to reflect on the social reconstruction that would be needed in Britain once the Second World War was over. At the same time he was a prolific writer on theological, ecumenical, and social topics, and his two-volume Readings in St. John’s Gospel, written in the early days of the war, rapidly became a spiritual classic. In 1942 Temple was appointed Archbishop of Canterbury and reached an even wider audience through his wartime radio addresses and newspaper articles. However, the scope of his responsibilities and the pace he set himself took their toll. On October 26, 1944 , he died after only two and a half years at Canterbury. I. O God of light and love, who illumined thy Church through the witness of thy servant William Temple: Inspire us, we pray, by his teaching and example, that we may rejoice with courage, confidence, and faith in the Word made flesh, and may be led to establish that city which has justice for its foundation and love for its law; through Jesus Christ, the light of the world, who liveth and reigneth with thee and the Holy Spirit, one God, now and for ever. Amen. II. O God of light and love, who illumined your Church through the witness of your servant William Temple: Inspire us, we pray, by his teaching and example, that we may rejoice with courage, confidence, and faith in the Word made flesh, and may be led to establish that city which has justice for its foundation and love for its law; through Jesus Christ, the light of the world, who lives and reigns with you and the Holy Spirit, one God, now and for ever. Amen. Bio. If we could squeeze it in, he could use a ‘who he is’ and ‘why he is important’ statement. Just because increasingly everybody may not know of his importance. It would be nice to remember that his Nature, Man, and God was a brilliant contribution to systematic and philosophical theology too. Sorry to nitpick, but the Psalm citation has a dash where it needs a zero (“Psalm 119:97-1-4”). My paperback copy of READINGS IN ST.JOHN’S GOSPEL is over 20 years old and falling apart. When the Gospel is from John, Temple’s book is the first thing I look at to prepare my sermon. Under the revised SCLM policy, this commemoration might be moved to October 26th, to share with Alfred the Great. William Temple is not selected merely because he became Archbishop of Canterbury. I suggest “and Theologian” be added to the subheading. Line 3 of the fifth paragraph: insert “also” after “but”. In the penultimate line of the final paragraph, I would add “at Westgate-on-Sea, Kent” after “died”. Without that clarification, there’s an implication that he died in Canterbury. An alternative would be to substitute “as archbishop” for “at Canterbury”. William Temple is a welcomed addition to the calendar, for me. He has been “larger than life” in my estimation, and no matter how much is said of him it strikes me as not quite covering all his important contributions by far. I say this not to criticize the write-up, but to emphasize how enthusiastically I welcome this commemoration. A point I don’t fully grasp is the reference to “the ‘Life and Liberty’ movement for reform within the Church of England.” I’d like to know what kind of “reform” – liturgical forms, moral norms, social inclusivity, financial structure, doctrinal/theological matters, reform of polity, all of the above, none of the above? “Life and Liberty” doesn’t explain to me the answer to that blank in my knowledge bank. The lessons vary. The gospel seems most apropos. The epistle is serviceable, although I’d prefer a reading that includes the mission of reconciliation, for example, 2 Cor. 5:16-20 (‘if anyone is in Christ, there is a new creation: everything old has passed away; see, everything has become new!”). I can “settle for” the OT and Psalm, but they don’t strike me as strong choices. They’re more like generic space-holders. Temple, his God, and the scope of Temple’s contributions, all deserve passages with a larger vision than these two. Thank you for including William Temple. I found this a very important contribution to my praying today and I believe the church will benefit from remembering him in prayer. Certainly Temple is one of the most able Anglican theologians, He and Michael Ramsey would be an excellent pair, once Michael hhas been dead long enough to include. The propers themselves work well, but the biob needs better info, The names of some of his better known books might help. But unless you think these bios are fit to be read aloud in lieu of a sermon, they are good starting places. well you could have added what places where important to william temple (archbishop of canterbury). What work is the quote from? “the personality of every man and women is sacred”? Wasn’t Temple the A of C who was appalled by the elevation of the first woman to the priesthood (Florence Li Tim-Oi)? I find it useful to note the less-than-wonderful aspects of saints’ lives. Often they reveal a great deal about the historical realities of their era. They also remind us that we are all broken vessels.